For the equipment manufacturer company "Monster Inc.", see Monster Cable. For the franchise, see Monsters, Inc. (franchise). For the 2001 video game, see Monsters, Inc. (video game). Monsters, Inc. is a 2001 American computer-animated comedy film produced by Pixar Animation Studios and distributed by Walt Disney Pictures. Featuring the voices of John Goodman, Billy Crystal, Steve Buscemi, James Coburn, and Jennifer Tilly, the film was directed by Pete Docter in his directorial debut, and executive produced by John Lasseter and Andrew Stanton. The film centers on two monsters – James P. "Sulley" Sullivan and his one-eyed partner and best friend Mike Wazowski – employed at the titular energy-producing factory Monsters, Inc, which generates power by scaring human children. The monster world believes that children are toxic, and when a small child enters the factory, Sulley and Mike must return her home before it is too late. Docter began developing the film in 1996, and wrote the story with Jill Culton, Jeff Pidgeon and Ralph Eggleston. Stanton wrote the screenplay with screenwriter Dan Gerson. The characters went through many incarnations over the film's five-year production process. The technical team and animators found new ways to render fur and cloth realistically for the film. Randy Newman, who composed the music for Pixar's three prior films, returned to compose its fourth. Monsters, Inc. was praised by critics and proved to be a major box office success from its release on November 2, 2001, generating over $577 million worldwide and becoming the third highest-grossing film of 2001. The film won the Academy Award for Best Original Song for (“If I Didn’t Have You”) and was nominated for three more, including for the new category: Best Animated Feature. Monsters, Inc. saw a 3D re-release in theaters on December 19, 2012. A prequel titled Monsters University, which was directed by Dan Scanlon, was released on June 21, 2013. A web-series Monsters at Work will release on Disney+ in 2020. The city of Monstropolis in the monster world is powered by energy from the screams of human children. At the Monsters, Inc., factory, skilled monsters employed as "scarers" venture into the human world to scare children and harvest their screams, through doors that activate portals to children's bedroom closets. It is considered dangerous work, as human children are believed to be toxic. Energy production is falling because children are becoming less easily scared, and Henry J. Waternoose, the company's chairman, is determined to find a solution to the problem. James P. "Sulley" Sullivan and his partner, Mike Wazowski, are the organization's top employees, but their chief rival, Randall Boggs, is close behind. One day, Sulley discovers that Randall has left a door activated on the scare floor and a small girl has entered the factory. After several failed attempts to put her back, Randall sends the door back into the factory's door vault and Sulley conceals her and takes her out of the factory. He interrupts Mike's date with his girlfriend, Celia, at a sushi restaurant, and chaos erupts when the child is discovered. Sulley and Mike manage to escape with the child before the Child Detection Agency (CDA) quarantines the restaurant. They soon discover that she is not toxic after all; Sulley grows attached to her and calls her "Boo," while Mike is just anxious to be rid of her. The duo smuggle her back into the factory disguised as a baby monster and attempt to send her home. Randall discovers Boo and tries to kidnap her, but mistakenly kidnaps Mike instead. He straps Mike to a large machine called "The Scream Extractor", which he intends to use to revolutionize the scaring industry and solve the monster world's energy problems by forcefully extracting screams from kidnapped human children. Before Randall can use the machine on Mike, Sulley intervenes and reports Randall to Waternoose. But Waternoose, who is secretly in league with Randall, exiles Mike and Sulley to the Himalayas instead. The two meet the Abominable Snowman, who tells them about a nearby village, which Sulley realizes he can use to return to the factory. Sulley prepares to return, but Mike refuses to go with him. Meanwhile, Randall is preparing to use the Scream Extractor on Boo, but Sulley suddenly arrives and saves her, destroying the machine in the process. Randall and Sulley battle, and after Mike returns and helps Sulley overpower Randall, the two reconcile, take Boo, and flee. Randall pursues them to the door vault, and a wild chase ensues among the millions of doors as they move in and out of the storage vault on rails to the factory floor. Boo's laughter causes all the doors to activate at once, allowing the monsters to freely pass in and out of the human world. Randall attempts to kill Sulley, but Boo overcomes her fear of Randall and attacks him, enabling Sulley to catch him. Sulley and Mike then trap Randall in the human world, where two residents at a trailer park mistake him for an alligator and beat him with a shovel. Sulley and Mike take Boo and her door to the training room, and trick Waternoose into revealing his plot with Randall, with help from the CDA and Roz, the scare floor secretary, who is revealed to be the CDA's leader. Mike secretly records the entire conversation for the CDA to review. Waternoose is arrested. Roz thanks Sulley and Mike for their help, orders them to return Boo home, and has Boo's door demolished to prevent any monsters from making further contact with her. With the factory temporarily shut down, Sulley is named the new CEO of Monsters, Inc. Under his leadership, the energy crisis is solved by harvesting children's laughter instead of screams, as laughter has been found to be ten times more potent. Mike takes Sulley aside, revealing he has rebuilt Boo's door. It needs one final piece, which Sulley took as a memento, in order to work. Sulley puts the door chip into place, enters and joyfully reunites with Boo. John Goodman as James P. "Sulley" Sullivan, a huge, furry blue ogre with horns and purple spots. Even though he excels at scaring children, he is a gentle giant by nature. At the film's beginning, he has been the "Best Scarer" at Monsters, Inc. for several months running. Billy Crystal as Michael "Mike" Wazowski, a short, round green monster with a single big eyeball and skinny limbs. He is Sulley's station runner and coach on the scare floor, and the two are close friends and roommates. He is charming and generally the more organized of the two, but is prone to neurotics and his ego sometimes leads him astray. He is dating Celia Mae, who calls him "Googly-Bear". Mary Gibbs as Boo, a two-year-old human girl who is unafraid of any monster except Randall, the scarer assigned to her door. She believes Sulley is a large cat and refers to him as "Kitty". In the film, one of Boo's drawings is covered with the name "Mary". The book based on the film gives Boo's "real" name as Mary Gibbs, the name of her voice actress, who is also the daughter of one of the film's story artists, Rob. Steve Buscemi as Randall Boggs, a purple, eight-legged lizard monster with a chameleon-like ability to change his skin color and blend in completely with his surroundings. He is a snide and preening character who makes himself a rival to Sulley and Mike in scream collection. James Coburn as Henry J. Waternoose III, an arthropodic monster with a crab-like lower body. He is the CEO of Monsters, Inc., a job passed down through his family for three generations. He acts as a mentor to Sulley, holding great faith in him as a scarer. Jennifer Tilly as Celia Mae, a gorgon-like monster with one eye and tentacle-like legs. She is the receptionist for Monsters, Inc. and Mike's girlfriend. Bob Peterson as Roz, a slug-like monster with a raspy voice who administrates for Scare Floor F where Sulley, Mike, and Randall work. At the end of the movie, it is revealed that Roz is "Agent Number 1" of the CDA, and has worked undercover at Monsters, Inc. for two and a half years. John Ratzenberger as Yeti a.k.a. The Abominable Snowman, a furry white monster who was banished to the Himalayas. He was inspired by the Abominable Snowman from the 1964 Rankin/Bass animated special Rudolph the Red-Nosed Reindeer. Frank Oz as Jeff Fungus, Randall's red-skinned, three-eyed, beleaguered assistant. Dan Gerson as Needleman and Smitty, two goofy monsters with cracking voices, who work as janitors and operate the Door Shredder when required. Steve Susskind as Jerry Slugworth, a red, seven-fingered monster, who manages Scare Floor F and is a good friend of Waternoose. Bonnie Hunt as Ms. Flint, a female monster, who trains new monsters to scare children. Jeff Pidgeon as Thaddeus "Phlegm" Bile, a trainee scarer for Monsters, Inc.
Samuel Lord Black as George Sanderson, a chubby, oranged-furred monster with a sole horn on top of his head. A running gag throughout the film involves George repeatedly making contact with human artifacts (such as socks and the like which cling to his fur via static), prompting his scare coach to trigger "23–19" incidents with the CDA resulting in him mobbed, shaved bald, and sterilized. He is good friends with Pete "Claws" Ward. When production began in earnest on Monsters, Inc. in 2000, Pixar relocated to a larger building in Emeryville, California. The idea for Monsters, Inc. was conceived in a lunch in 1994 attended by John Lasseter, Pete Docter, Andrew Stanton and Joe Ranft during the production of Toy Story. One of the ideas that came out of the brainstorming session was a film about monsters. "When we were making Toy Story", Docter said, "everybody came up to me and said 'Hey, I totally believed that my toys came to life when I left the room.' So when Disney asked us to do some more films, I wanted to tap into a childlike notion that was similar to that. I knew monsters were coming out of my closet when I was a kid. So I said, 'Hey, let's do a film about monsters.'" Docter began work on the film that would become Monsters, Inc. in 1996 while others focused on A Bug's Life (1998) and Toy Story 2 (1999). Its code name was Hidden City, named for Docter's favorite restaurant in Point Richmond. By early-February 1997, Docter had drafted a treatment together with Harley Jessup, Jill Culton, and Jeff Pidgeon that bore some resemblance to the final film. Docter pitched the story to Disney with some initial artwork on February 4 that year. He and his story team left with some suggestions in hand and returned to pitch a refined version of the story on May 30. At this pitch meeting, longtime Disney animator Joe Grant – whose work stretched back to Snow White and the Seven Dwarfs (1937) – suggested the title Monsters, Inc., a play on the title of a gangster film Murder, Inc., which stuck. The film marks the first Pixar feature to not be directed by Lasseter instead being helmed by Docter, as well as Lee Unkrich and David Silverman who served as co-directors. The storyline took on many forms during production. Docter's original idea featured a 30-year-old man dealing with monsters that he drew in a book as a child coming back to bother him as an adult. Each monster represented a fear he had, and conquering those fears caused the monsters to eventually disappear. After Docter scrapped the initial concept of a 30-year-old terrified of monsters, he decided on a buddy story between a monster and a child titled simply Monsters, in which the monster character of Sulley (known at this stage as Johnson) was an up-and-comer at his workplace, where the company's purpose was to scare children. Sulley's eventual sidekick, Mike Wazowski, had not yet been added. Between 1996 and 2000, the lead monster and child went through radical changes as the story evolved. As the story continued to develop, the child varied in age and gender. Ultimately, the story team decided that a girl would be the best counterpart for a furry, 8-foot-tall (96 in) co-star. After a girl was settled upon, the character continued to undergo racial changes, at one point being from Ireland and at another time being an African-American character. Originally the character of the little girl, known as Mary, became a fearless seven-year-old who has been toughened by years of teasing and pranks from four older brothers. In stark contrast, Johnson is nervous about the possibility of losing his job after the boss at Monsters, Inc. announces a downsizing is on the way. He feels envious because another scarer, Ned (who later became Randall), is the company's top performer. Through various drafts, Johnson's occupation went back-and-forth from being a scarer and from working in another area of the company such as a janitor or a refinery worker, until his final incarnation as the best scarer at Monsters, Inc. Throughout development Pixar worried that having a main character whose main goal was to scare children would alienate audiences and make them not empathize with him. Docter would later describe that the team "bent over backwards trying to create a story that still had monsters " while still solving the problem, A key moment came when the team decided "Okay, he's the BEST scarer there. He's the star quarterback" with Docter noting that before that moment "design after design, we really didn't know what he was about." Disney noted to Pixar early on that they did not want the character to "look like a guy in a suit". To this end Johnson was originally planned to have tentacles for feet; however, this caused many problems in early animation tests. The idea was later largely rejected, as it was thought that audiences would be distracted by the tentacles. Mary's age also differed from draft to draft until the writers settled on the age of 3. "We found that the younger she was, the more dependent she was on Sulley", Docter said. Eventually Johnson was renamed Sullivan. The name was suggested by an animator who had attended Texas A&M University, inspired by one of Texas A&M's historic icons, Lawrence Sullivan Ross, nicknamed "Sulley" by students. Sullivan was also planned to wear glasses throughout the film. However, the creators found it a dangerous idea because the eyes were a perfectly readable and clear way of expressing a character's personality; thus, the idea was rejected. The idea of a monster buddy for the lead monster emerged at an April 6, 1998 "story summit" in Burbank with employees from Disney and Pixar. A term coined by Lasseter, a "story summit" was a crash exercise that would yield a finished story in only two days. Such a character, the group agreed, would give the lead monster someone to talk to about his predicament. 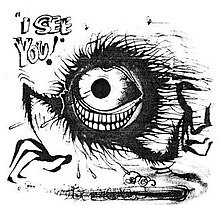 Development artist Ricky Nierva drew a concept sketch of a rounded, one-eyed monster as a concept for the character, and everyone was generally receptive to it. Docter named the character Mike for the father of his friend Frank Oz, a director and Muppet performer. Jeff Pidgeon and Jason Katz story-boarded a test in which Mike helps Sulley choose a tie for work, and Mike Wazowski soon became a vital character in the film. Originally, Mike had no arms and had to use his legs as appendages; however, due to some technical difficulties, arms were soon added to him. Screenwriter Dan Gerson joined Pixar in 1999 and worked on the film with the filmmakers on a daily basis for almost two years. He considered it his first experience in writing a feature film. He explained, "I would sit with Pete [Docter] and David Silverman and we would talk about a scene and they would tell me what they were looking for. I would make some suggestions and then go off and write the sequence. We'd get together again and review it and then hand it off to a story artist. Here's where the collaborative process really kicked in. The board artist was not beholden to my work and could take liberties here and there. Sometimes, I would suggest an idea about making the joke work better visually. Once the scene moved on to animation, the animators would plus the material even further." Bill Murray was considered for the voice role of James P. "Sulley" Sullivan. He screen tested for the role and was interested, but when Pete Docter was unable to make contact with him, he took it as a "no". The voice role of Sulley went to John Goodman, the longtime co-star of the comedy series Roseanne and a regular in the films of the Coen brothers. Goodman interpreted the character to himself as the monster equivalent of a National Football League player. "He's like a seasoned lineman in the tenth year of his career," he said at the time. "He is totally dedicated and a total pro." Billy Crystal, having regretted turning down the part of Buzz Lightyear years prior, accepted that of Mike Wazowski, Sulley's one-eyed best friend and scare assistant. The casting of Steve Buscemi as Randall, Sulley's rival, saw a reunion between himself and John Goodman; they had previously worked together on The Big Lebowski and Barton Fink. The "door vault" scene is one of the film's most elaborate sets. In November 2000, early in the production of Monsters, Inc., Pixar packed up and moved for the second time since its Lucasfilm years. The company's approximately 500 employees had become spread among three buildings, separated by a busy highway. The company moved from Point Richmond to a much bigger campus in Emeryville, co-designed by Lasseter and Steve Jobs. In production, Monsters, Inc. differed from earlier Pixar features, as every main character in this movie had its own lead animator – John Kahrs on Sulley, Andrew Gordon on Mike, and Dave DeVan on Boo. Kahrs found that the "bearlike quality" of Goodman's voice provided an exceptionally good fit with the character. He faced a difficult challenge, however, in dealing with Sulley's sheer mass; traditionally, animators conveyed a figure's heaviness by giving it a slower, more belabored movement, but Kahrs was concerned that such an approach to a central character would give the film a "sluggish" feel. Like Goodman, Kahrs came to think of Sulley as a football player, one whose athleticism enabled him to move quickly in spite of his size. To help the animators with Sulley and other large monsters, Pixar arranged for Rodger Kram, a University of California, Berkeley expert on the locomotion of heavy mammals, to lecture on the subject. Adding to Sulley's lifelike appearance was an intense effort by the technical team to refine the rendering of fur. Other production houses had tackled realistic fur, most notably Rhythm & Hues in its 1993 polar bear commercials for Coca-Cola and in its talking animals' faces in the 1995 film Babe. This film, however, required fur on a far larger scale. From the standpoint of Pixar's engineers, the quest for fur posed several significant challenges; one was to figure out how to animate a large numbers of hairs – 2,320,413 of them on Sulley – in a reasonably efficient way, and another was to make sure that the hairs cast shadows on other ones. Without self-shadowing, either fur or hair takes on an unrealistic flat-colored look (e.g., in Toy Story, the hair on Andy's toddler sister, as seen in that movie's opening sequence, is hair without self-shadowing). The first fur test allowed Sulley to run an obstacle course. Results were not satisfactory, as such objects caught and stretched out the fur due to the extreme amount of motion. Another similar test was also unsuccessful, because, this time, the fur went through the objects. Pixar then set up a Simulation department and created a new fur simulation program called Fizt (short for "physics tool"). After a shot with Sulley in it had been animated, this department took the data for that shot and added Sulley's fur. Fizt allowed the fur to react in a more natural way. Every time when Sulley had to move, his fur (automatically) reacted to his movements, thus taking the effects of wind and gravity into account as well. The Fizt program also controlled the movement of Boo's clothes, which provided another "breakthrough". The deceptively simple-sounding task of animating cloth was also a challenge to animate thanks to those hundreds of creases and wrinkles that automatically occurred in the clothing when the wearer moved. Also, this meant they had to solve the complex problem of how to keep cloth untangled – in other words, to keep it from passing through itself when parts of it intersect. Fizt applied the same system to Boo's clothes as to Sulley's fur. First of all, Boo was animated shirtless; the Simulation department then used Fizt to apply the shirt over Boo's body, and every time she moved, her clothes also reacted to her movements in a more natural manner. To solve the problem of cloth-to-cloth collisions, Michael Kass, Pixar's senior scientist, was joined on Monsters, Inc. by David Baraff and Andrew Witkin and developed an algorithm they called "global intersection analysis" to handle the problem. The complexity of the shots in the film, including elaborate sets such as the door vault, required more computing power to render than any of Pixar's earlier efforts combined. The render farm in place for Monsters, Inc. was made up of 3500 Sun Microsystems processors, compared with 1400 for Toy Story 2 and only 200 for Toy Story. The film premiered on October 28, 2001, at the El Capitan Theatre in Hollywood, California. It was theatrically released on November 2, 2001 in the United States, in Australia on December 26, 2001, and in the United Kingdom on February 8, 2002. The theatrical release was accompanied with the Pixar short animated film For the Birds. As with A Bug's Life and Toy Story 2, a montage of "outtakes" and a performance of a play based on a line from the film were made and included in the end credits of the film starting on December 7, 2001. After the success of the 3D re-release of The Lion King, Disney and Pixar re-released Monsters, Inc. in 3D on December 19, 2012. Monsters, Inc. was released on VHS and DVD on September 17, 2002. It was then released on Blu-ray on November 10, 2009, and on Blu-ray 3D on February 19, 2013. Monsters, Inc. ranked number 1 at the box office on its opening weekend, grossing $62,577,067 in North America alone. The film had a small drop-off of 27.2% over its second weekend, earning another $45,551,028. In its third weekend, the film experienced a larger decline of 50.1%, placing itself in the second position just after Harry Potter and the Philosopher's Stone. In its fourth weekend, however, there was an increase of 5.9%, making $24,055,001 that weekend for a combined total of over $525 million. As of May 2013, it is the eighth-biggest fourth weekend ever for a film. The film made $289,916,256 in North America, and $287,509,478 in other territories, for a worldwide total of $577,425,734. The film is Pixar's ninth highest-grossing film worldwide and sixth in North America. For a time, the film surpassed Toy Story 2 as the second highest-grossing animated film of all time, only behind 1994's The Lion King. In the U.K., Ireland, and Malta, it earned £37,264,502 ($53,335,579) in total, marking the sixth highest-grossing animated film of all time in the country and the thirty-second highest-grossing film of all time. In Japan, although earning $4,471,902 during its opening and ranking second behind The Lord of the Rings: The Fellowship of the Ring for the weekend, it moved to first place on subsequent weekends due to exceptionally small decreases or even increases and dominated for six weeks at the box office. It finally reached $74,437,612, standing as 2001's third highest-grossing film and the third largest U.S. animated feature of all time in the country behind Toy Story 3 and Finding Nemo. Review aggregator Rotten Tomatoes gave the film a score of 96% based on 194 reviews, with an average score of 8/10. The critical consensus was, "Clever, funny, and delightful to look at, Monsters, Inc. delivers another resounding example of how Pixar elevated the bar for modern all-ages animation." Metacritic, which assigns a rating out of 100 top reviews from mainstream critics, calculated a score of 78 based on 34 reviews, indicating "generally favorable reviews". According to CinemaScore, audiences gave the film a rare "A+" grade, becoming the second Pixar film to gain an "A+" grade, after Toy Story 2. Charles Taylor from Salon.com stated, "[i]t's agreeable and often funny, and adults who take their kids to see it might be surprised to find themselves having a pretty good time." Elvis Mitchell from The New York Times gave it a positive review, praising the film's use of "creative energy", saying "There hasn't been a film in years to use creative energy as efficiently as Monsters, Inc." Although Mike Clark from USA Today thought the comedy was sometimes "more frenetic than inspired and viewer emotions are rarely touched to any notable degree", he also viewed the film as "visually inventive as its Pixar predecessors". ReelViews film critic James Berardinelli gave the film 3​1⁄2 stars out of 4 and wrote that the film was "one of those rare family films that parents can enjoy (rather than endure) along with their kids". Roger Ebert from the Chicago Sun-Times gave the film 3 out of 4 stars, calling it "cheerful, high-energy fun, and like the other Pixar movies, has a running supply of gags and references aimed at grownups". Lisa Schwarzbaum from Entertainment Weekly gave the film a "B+" grade and praised the film's animation, stating "Everything from Pixar Animation Studios – the snazzy, cutting-edge computer animation outfit – looks really, really terrific and unspools with a liberated, heppest-moms-and-dads-on-the-block iconoclasm." Monsters, Inc. won the Academy Award for Best Original Song (Randy Newman, after fifteen previous nominations, for "If I Didn't Have You"). It was one of the first animated films to be nominated for Best Animated Feature (lost to Shrek). It was also nominated for Best Original Score (lost to The Lord of the Rings: The Fellowship of the Ring) and Best Sound Editing (lost to Pearl Harbor). At the Kid's Choice Awards in 2002, it was nominated for "Favorite Voice in an Animated Movie" for Billy Crystal (who lost to Eddie Murphy in Shrek). Monsters Inc. was Randy Newman's fourth feature film collaboration with Pixar. The end credits song "If I Didn't Have You" was sung by John Goodman and Billy Crystal. The album was nominated for the Academy Award for Best Original Score and a Grammy Award for Best Score Soundtrack for Visual Media. The score lost both these awards to The Lord of the Rings: The Fellowship of the Ring, but after sixteen nominations, the song "If I Didn't Have You" finally won Newman his first Academy Award for Best Original Song. It also won a Grammy Award for Best Song Written for Visual Media. All tracks written by Randy Newman. Shortly before the film's release, Pixar was sued by children's songwriter Lori Madrid of Wyoming, stating that the company had stolen her ideas from her 1997 poem "There's a Boy in My Closet". Madrid mailed her poem to six publishers in October 1999, notably Chronicle Books, before turning it into a local stage musical in August 2001. After seeing the trailer for Monsters, Inc., Madrid concluded that Chronicle Books had passed her work to Pixar and that the film was based on her work. In October 2001, she filed the suit against Chronicle Books, Pixar, and Disney in a federal court in Cheyenne, Wyoming. Her lawyer asked the court to issue a preliminary injunction, that would forbid Pixar and Disney from releasing the film while the suit was pending. In a hearing on November 1, 2001 – the day before the film's scheduled release on 5,800 screens in 3,200 theaters across the country – the judge refused to issue the injunction. On June 26, 2002, he ruled that the film had nothing in common with the poem. In November 2002, Stanley Mouse filed a lawsuit, in which he alleged that the characters of Mike and Sulley were based on drawings of Excuse My Dust, a film that he had tried to sell to Hollywood in 1998. The lawsuit also stated that a story artist from Pixar visited Mouse in 2000, and discussed Mouse's work with him. A Disney spokeswoman responded, by saying that the characters in Monsters, Inc. were "developed independently by the Pixar and Walt Disney Pictures creative teams, and do not infringe on anyone's copyrights". The case was ultimately settled under undisclosed terms. A prequel, titled Monsters University, was released on June 21, 2013. John Goodman, Billy Crystal, and Steve Buscemi reprised their roles of Sulley, Mike, and Randall, while Dan Scanlon directed the film. The prequel's plot focuses on Sulley and Mike's studies at Monsters University, where they start off as rivals but soon become best friends. An animated short, Mike's New Car, was made by Pixar in 2002 in which the two main characters have assorted misadventures with a car Mike has just bought. This film was not screened in theaters, but is included with all home video releases of Monsters, Inc., and on Pixar's Dedicated Shorts DVD. In August 2002, a manga version of Monsters, Inc. was made by Hiromi Yamafuji and distributed in Kodansha's Comic Bon Bon magazine in Japan; the manga was published in English by Tokyopop until it went out of print. A series of video games, including a multi-platform video game were created based on the film. The video games included Monsters, Inc., Monsters, Inc. Scream Team and Monsters, Inc. Scream Arena. A game titled Monsters, Inc. Run was released on the App Store for iPhone, iPod Touch, and iPad on December 13, 2012. Feld Entertainment toured a Monsters, Inc. edition of their Walt Disney's World on Ice skating tour from 2003 to 2007. Monsters, Inc. has inspired three attractions at Disney theme parks around the world. In 2006 Monsters, Inc. Mike & Sulley to the Rescue! opened at Disneyland Resort's Disney California Adventure in Anaheim, California. In 2007, Monsters, Inc. Laugh Floor opened at Walt Disney World Resort's Magic Kingdom in Lake Buena Vista, Florida, replacing The Timekeeper. The show is improvisational in nature, and features the opportunity for Guests to interact with the monster comedians and submit jokes of their own via text message. In 2009 Monsters, Inc. Ride & Go Seek opened at Tokyo Disney Resort's Tokyo Disneyland in Chiba, Japan. In 2009, Boom! Studios produced a Monsters Inc. comic book mini-series that ran for four issues. The storyline takes place after the movie and focuses on Sulley and Mike's daily struggles to operate Monsters Inc. on its new laughter-focused company policy. At the same time, their work is impeded by the revenge schemes of Randall and Waternoose, as well as a human child (indirectly revealed to be Sid Phillips from the Toy Story franchise) who has hijacked the company's closet door technology to commit a string of toy thefts throughout the human world. A world based on the film made its debut appearance in the Kingdom Hearts series in Kingdom Hearts III, making it the second Disney-Pixar movie featured in the series after Toy Story. The world takes place after the events of the first film. In November 2017, Disney CEO Bob Iger spoke about plans to develop a television series spin-off of Monsters, Inc. among other properties owned by the company. By November of the following year the series was confirmed for Disney+, and will reportedly continue the story of the previous films. On April 9, 2019, it was announced that Goodman, Crystal, and Tilly would return as Mike, Sulley, and Celia, respectively for the series. In addition, Ratzenberger will not only return as Yeti, but will also voice a new character, Bernard, and Peterson will not only voice Roz, but Roz's twin sister, Roze. Additional cast members will include Ben Feldman as mechanic monster Tylor Tuskmon, Kelly Marie Tran as Tylor's friend Val Little, Henry Winkler as the new boss Fritz, Lucas Neff as Duncan, a plumber, Alanna Ubach as Cutter, Stephen Stanton as Needleman and Smitty (replacing Gerson), and Aisha Tyler as Tylor's mother Millie. The series will be released on Disney+ in 2020. ^ a b c d e "Monsters, Inc. (2001) – Box Office Mojo". ^ Taylor, Drew (December 21, 2012). "Review: 'Monsters, Inc.' In 3D Is Just As Much Fun As It Was The First Time Around". IndieWire. Retrieved August 22, 2016. ^ Corliss, Richard (June 13, 2013). "Pixar's Monsters University: When Hairy Met Scary". Time. Archived from the original on March 17, 2015. Retrieved September 27, 2015. ^ Veltman, Chloe (December 31, 2001). "Fun factory". The Telegraph. Archived from the original on September 27, 2015. Retrieved September 27, 2015. ^ Cohen, Karl (October 26, 2001). "Monsters, Inc.: The Secret Behind Why Pixar Is So Good". Animated World Network. Archived from the original on September 15, 2015. Retrieved September 27, 2015. ^ Goldberg, Haley. "Boo From 'Monsters, Inc.' Is A Grown-Up Yoga Master Now". ^ "Monsters, Inc. (2001)". British Film Institute. Retrieved September 27, 2015. ^ Nusair, David. "Top 5 John Ratzenberger Roles in Pixar Films". About.com. Archived from the original on May 19, 2011. Retrieved September 27, 2015. Abominable. Can you believe that? Do I look abominable to you? Why can't they call me the Adorable Snowman, or the Agreeable Snowman, for crying out loud? I'm a nice guy. ^ Brown, Scott (November 9, 2001). "The moments you missed in Monsters, Inc.". Entertainment Weekly. Archived from the original on September 27, 2015. Retrieved September 27, 2015. ^ Ziebarth, Christian (July 1, 2005). "Joe Grant Life Celebration". Animation World Network. Retrieved May 16, 2015. ^ a b c d Snetiker, Marc. "Pete Docter dives deep into Monsters, Inc. legacy and creation, 15 years later". Entertainment Weekly. Retrieved November 4, 2016. ^ a b c d e "Monsters Inc: Production Notes". Culture.com. Retrieved June 19, 2012. ^ Davis, Erik (November 13, 2009). "The Original Pitch for 'Monsters, Inc.'". Cinematical. Archived from the original on August 8, 2010. Retrieved August 8, 2010. ^ a b c Early Tests. Commentary by Thomas Porter, Steve May and Michael Fong, Monsters Inc. 2002 DVD. ^ Farr, John (September 19, 2014). "Bill Murray and the Roles That Got Away". Retrieved May 25, 2015. ^ Fischer, Paul. "Billy Crystal – Cranky Critic StarTalk". Archived from the original on October 20, 2008. Retrieved March 11, 2009. ^ Pearlman, Cindy (October 28, 2001). "Crystal clear on 'Monsters'" (Fee required). Chicago Sun-Times. Retrieved March 16, 2009. ^ "World Premiere of Disney/Pixar's MONSTERS, INC". The Free Library. October 28, 2001. Retrieved March 1, 2014. ^ "Monsters, Inc. | UK Cinema Release Date". Filmdates.co.uk. Retrieved October 24, 2013. ^ Linder, Brian (February 13, 2002). "Oscar Spotlight: Animated Short Film". IGN. Retrieved November 23, 2012. ^ "Animated 'Outtakes' Show Life 'Behind The Screams' With Disney/Pixar's 'Monsters, Inc.'". PR Newswire. December 4, 2001. Retrieved March 19, 2017. ^ Smith, Grady (October 4, 2011). "'Beauty and the Beast,' 'The Little Mermaid,' 'Finding Nemo,' 'Monsters, Inc.' get 3-D re-releases". Entertainment Weekly. Retrieved October 27, 2011. ^ "Disney Moves Up 'Monsters Inc 3D' To December". Deadline. July 24, 2012. Retrieved July 24, 2012. ^ "The Most Anticipated Monster Movie Hit Comes to DVD and VHS". Pixar. March 1, 2002. Archived from the original on October 15, 2006. Retrieved November 13, 2011. ^ McCutcheon, David (August 10, 2009). "Monsters, Inc. Founded". IGN. Retrieved November 13, 2011. ^ "Monsters, Inc. - 3D: Ultimate Collector's Edition". High-Def Digest. Retrieved December 31, 2012. ^ "Monsters, Inc. – Weekend Grosses". Box Office Mojo. Retrieved September 4, 2010. ^ "Top Weekends: 2nd – 12th – Weekend Grosses". Box Office Mojo. Retrieved September 4, 2010. ^ "Pixar Movies at the Box Office". Box Office Mojo. Retrieved September 4, 2010. ^ "United Kingdom and Ireland and Malta Box Office Index". Box Office Mojo. Retrieved February 17, 2011. ^ "Japan Yearly Box Office". Box Office Mojo. Retrieved February 17, 2011. ^ "Monsters, Inc (2001)". Rotten Tomatoes. Fandango Media. Retrieved April 4, 2018. ^ "Monsters, Inc. Reviews". Metacritic. CBS Interactive. Retrieved September 1, 2010. ^ "CinemaScore". cinemascore.com. Retrieved March 16, 2015. ^ "Cinemascore :: Movie Title Search". cinemascore.com. Retrieved August 9, 2015. ^ Taylor, Charles (November 2, 2001). "Monsters, Inc: The new animated feature from Pixar has too much Disney pap and not enough Gothic". Salon. Archived from the original on October 15, 2010. Retrieved September 1, 2010. ^ Mitchell, Elvis (November 2, 2001). "Monsters of Childhood With Feelings and Agendas". The New York Times. Retrieved April 19, 2012. ^ Clark, Mike (November 5, 2001). "'Monsters, Inc.' yields dividends". USA Today. Retrieved September 1, 2010. ^ Berardinelli, James. "Monsters, Inc. – A movie review by James Berardinelli". Reelviews.net. Retrieved September 1, 2010. ^ Ebert, Roger (November 2, 2001). "Monsters, Inc". Chicago Sun-Times. Retrieved September 1, 2010. ^ Lisa Schwarzbaum (November 9, 2001). "Monsters, Inc". Entertainment Weekly. Retrieved September 1, 2010. ^ a b c d e f g "Monsters-Inc- - Cast, Crew, Director and Awards". The New York Times. October 20, 2013. Retrieved October 25, 2013. ^ Phares, Heather.Monsters, Inc. (An Original Walt Disney Records Soundtrack). AllMusic. ^ Freer, Ian. Monsters, Inc. Soundtrack review Archived November 10, 2013, at the Wayback Machine. Empire. ^ Monsters, Inc. (Randy Newman). Filmtracks.com. October 30, 2001. ^ Southall, James (2002). Monsters, Inc.. Movie Wave. ^ Goldwasser, Dan (October 21, 2001). Monsters, Inc. (2001) Soundtrack. Soundtrack.net Retrieved December 6, 2016. ^ Monsters, Inc. (An Original Walt Disney Records Soundtrack) - Randy Newman Awards. AllMusic. Rovi Corporation. Retrieved November 29, 2013. ^ a b Alicia Gaura, Maria (November 9, 2002). "Sonoma artist claims 'Monsters, Inc.' a rip-off". San Francisco Chronicle. Retrieved June 18, 2012. ^ Price. 2008. pp. 187-188. ^ Price. 2008. p. 189-193. ^ a b Shiels, Maggie (November 14, 2002). "Monsters Inc faces 'copying' lawsuit". BBC News. Archived from the original on September 1, 2009. Retrieved September 1, 2009. ^ S.M. Oliva (January 22, 2009). "Animation is Built on Plagiarism..." Archive.mises.org. Archived from the original on December 1, 2012. Retrieved May 15, 2013. ^ "Mike's New Car - Pixar Short: Pete Docter, Roger Gould, Gale Gortney: Amazon Video". Amazon.com. Retrieved May 13, 2013. ^ "Monsters, Inc. - Used for PlayStation 2". GameStop. January 16, 2012. Archived from the original on February 1, 2013. Retrieved May 13, 2013. ^ "'Monsters Inc. Run' by Disney Mobile Now Available for Apple iDevices". Stitch Kingdom. December 13, 2012. Archived from the original on November 10, 2013. Retrieved December 20, 2012. ^ Paul de Barros (October 29, 2004). "Entertainment & the Arts | Fur and flips: "Monsters, Inc." on ice | Seattle Times Newspaper". Community.seattletimes.nwsource.com. Retrieved May 13, 2013. ^ "Monsters, Inc: Mike and Sulley to the Rescue at Disney's California Adventure". Themeparkinsider.com. June 9, 2012. Retrieved May 13, 2013. ^ "Monsters, Inc. Laugh Floor | Walt Disney World Resort". Disney. March 28, 2013. Retrieved May 13, 2013. ^ "Monsters, Inc. Ride & Go Seek! | Tokyo Disneyland". Tokyodisneyresort.co.jp. Archived from the original on July 22, 2013. Retrieved May 13, 2013. ^ "Monsters, Inc.: Laugh Factory (Volume)". Comicvine.com. January 1, 2010. Retrieved July 6, 2013. ^ Pereira, Chris (February 10, 2018). "New Kingdom Hearts 3 Trailer Shows Monsters Inc. World, New Gameplay Details Revealed". GameSpot. Retrieved February 11, 2017. ^ Nunneley, Stephany (February 10, 2018). "Kingdom Hearts 3 release date coming at E3 2018, new trailer shows Monsters, Inc. characters". vg247. Retrieved February 11, 2018. ^ Fingas, Jon (July 15, 2017). "The world of 'Toy Story' is coming to 'Kingdom Hearts 3'". Engadget. Retrieved February 11, 2018. ^ Young, Rory (July 2017). "Kingdom Hearts 3 New Trailer Confirms Toy Story World". Game Rant. Retrieved February 11, 2018. ^ staff, Guardian (November 9, 2017). "Disney reveals plan for new Star Wars trilogy and live-action TV series" – via www.theguardian.com. ^ "Monsters Inc is getting a spin-off TV show". November 10, 2017. ^ Chmielewski, Dawn C. (November 9, 2017). "Disney Developing 'Star Wars', 'Monsters Inc.' TV Series For Streaming Service". ^ "New Star Wars and Marvel Series Announced for Disney+ Streaming Service". The Walt Disney Company. November 8, 2018. ^ Gelfand, Ilana (April 9, 2019). "HERE'S EVERYTHING WE KNOW ABOUT MONSTERS AT WORK, THE MONSTERS, INC.-INSPIRED ANIMATED SERIES COMING TO DISNEY+". Oh My Disney. Retrieved April 9, 2019. Wikimedia Commons has media related to Monsters, Inc..
Wikiquote has quotations related to: Monsters, Inc. This page was last edited on 21 April 2019, at 19:43 (UTC).